31-Oct-2006 -- All Hallows Eve in northwest Knoxville. After spending most of this beautiful fall day inside, at a meeting ten miles on the other side of the Tennessee River, I decided to conclude the afternoon by attempting my first confluence on the 84th West meridian. Little did I know I would wind up having to follow the ancient Halloween custom of going door to door through the neighborhood before I would have a ghost of a chance of reaching this confluence! Two visits to this spot were recorded only four days apart in March 2001. The first narrative pinpointed the location as being in the backyard of 5809 Stoneleigh Road. After taking the Merchants Road exit off Interstate 75, I headed southwest until making a right turn on Wilkerson Road. I then turned right into a subdivision where another left put me on the parallel Stoneleigh Road. The driveway at 5809 was empty and no one answered my knock at the front door. As the path to the backyard was open, I decided to see how quickly I could accomplish my mission. In my haste I could zero out either the latitude or longitude, but not both at the same time. I assumed I was being stymied by the thick evergreen trees as I approached the back fence. Frustrated I retreated to the road to consider my options. Just a few minutes later, a mother and her young son arrived home. I asked her 1) had anyone before asked to photograph her back yard, and 2) did she realize the special significance of its location. She answered “no” to both, but after a little more explanation and a demonstration of the GPS unit, she gave me permission to locate the point. Once more I met with no success. With a 375 mile drive ahead of me, I considered abandoning the project, but as I climbed back in my truck, it finally came to me the previous GPS screen photos from the 2001 visits were not easily readable, and the point I was seeking might not be at 5809 after all! I circled the block and introduced myself to the pleasant lady living at 5816 Wilkerson. I told her I had driven all the way from Mississippi to take a picture of her back yard; and if she would allow me to do so, I wouldn’t even ask for any “trick or treat” candy. Being in the correct backyard quickly solved all my problems, and I soon had my photograph of ten zeroes. Many Halloween customs predate Christianity, going back to Celtic practices associated with November 1st, which was Samhain (sä`wĭn), the beginning of winter and the Celtic new year. Witches and other evil spirits were believed to roam the earth on this evening, playing tricks on human beings to mark the season of diminishing sunlight. [As the United States had just gone off Daylight Savings Time on the previous Sunday, the diminishing daylight was going to disappear completely an hour sooner than it had a week earlier, and that was spooky enough by itself!] Bonfires were lit, offerings were made of dainty foods and sweets, and people would disguise themselves as one of the roaming spirits, to avoid demonic persecution. Survivals of these early practices can be found in countries of Celtic influence today, such as the United States, where children go from door to door in costumes demanding "trick or treat." Elated at my success I considered continuing Celtic tradition by lighting a bonfire right on the confluence to celebrate, but I decided not to impose on the owner’s hospitality and instead to follow the setting sun towards home. Well before reaching Nashville, TN, I had a true taste of the impending arrival of Samhain, as I encountered darkness, hard rain, and much chillier temperatures. Back home, an easy check of Google Earth(C)gave me a crystal clear aerial photograph of the 36N 084W area. The detail is truly amazing and I quickly got my bearings, matching my pictures of the site to those taken five years ago, and determining where the previous photographers stood. From the above view, I could even spot a yellow child’s play slide which I photographed from the side [my Picture #3, view to the southeast], but which can be seen head-on in Visit #2’s Picture #4. If I had checked Google before I left, I would not have been in such a fog while I was on site at 36N 084W, but then I wouldn’t have had such a sense of discovery, either. #1: Looking northeast to 36N 084W from Wilkerson Road. #2: Viewed from ten feet away, a chain link fence and a row of evergreens to the north form a backdrop for 36N 084W. #3: Clockwise from the upper left: Looking northeast, southeast, southwest, and northwest from 36N 084W. #4: Looking due east to 36N 084W from Wilkerson Road. #5: Reached through a gate to the right of the carport, the backyard of 5816 Wilkerson Road is home to 36N 084W. #6: After a five year delay, ten zeroes are finally recorded at 36N 084W. #7: Visit #1 on March 4, 2001, stopped just beyond this fence marking the northwest edge of the 5809 Stoneleigh Road backyard. #8: Visit #2 on March 8, 2001, reached the southeast corner of the backyard fence at 5809 Stoneleigh Road. 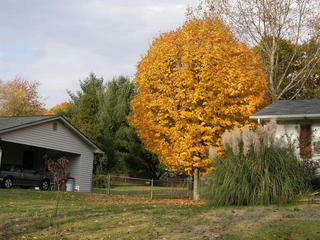 #9: Fall color as seen looking to the southeast from 5809 Stoneleigh Road.